Whether you're preparing for a delicious steak dinner for four or ordering gourmet steaks to give as gifts, The Kansas City Steak Company has been making mouths water since 1932, delivering the Kansas City steaks that have made them famous, right to your doorstep. for Free Shipping enter Priority Code - CR14FS - at checkout on the Kansas City Steak Company website. 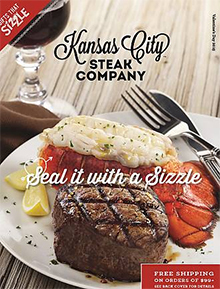 The Kansas City Steak Company - From premium steaks to succulent seafood, perfectly cooked poultry to Hickory Smoked pork ribs, Kansas City Steaks knows what's for dinner tonight. Enjoy the finest beef selections available online and a variety of other appetizing entrees for the entire family. If you have limited time to cook a gourmet meal, check out their easy to prepare Bake & Serve Gourmet Selections that are restaurant quality, deliciously seasoned and best of all, fast! Kansas City steaks - Take advantage of the Kansas City difference with a selection of Kansas City steaks you'll savor down to the last bite. Choose from premium Filet Mignon, Kansas City Strip Steaks, Ribeyes, Top Sirloin and T-Bone steaks, Porterhouse Steaks, Tenderloin pieces, Steakburgers and delicious steak combos that feature an assortment of the finest mid-western beef cuts available! Sprinkle on some Award-winning steak seasonings compliments of The Kansas City Steak Company, and you're ready for the meal of the century! Kansas City steak & more - Not the biggest steak eater? They've got both red meat eaters and non-red meat eaters covered. Besides their juicy selection of premium Kansas City steaks, The Kansas City Steak Company also features a menu of tender pork chops and poultry dishes from Chicken Cordon Bleu to boneless chicken breasts and fully cooked Hickory Smoked Turkeys! Care for some surf and turf? Pair your steak with seafood favorites including crab cakes, jumbo shrimp, lobster tails, crab claws and salmon fillets�and don't forget dessert! From succulent Rib Roasts and juicy top-qualiity steaks to Pumpkin Cognac Cheesecake and Bourbon Walnut Tarts for dessert, The Kansas City Steak Company serves up a delicious meal every time, from Kansas City's best.